Fruit Punch baby mangoes... really red. Thought this was kinda interesting. 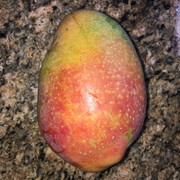 Of all the baby mangoes in the yard, the fruit punch seems to be super red comparatively speaking. First year of fruit punch fruiting. Re: Fruit Punch baby mangoes... really red. my first year also. I had the same observation, I was thinking they were going to drop off. 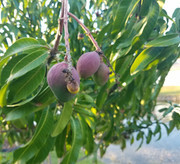 So what are they supposed to look like when ripe or when it is best to pick? This is a picture of mine last week. The whitish residue is from spraying surround wp a month ago. FP maybe a month away from fully ripe. I went to look up surround wp, and apparently you need a pesticide ID# to order kaolin clay in CA? You can grow and purchase weed with just an ID, but you need a pesticide license to buy clay. That makes so much sense. does diatomaceous earth works instead of using surround wp for insect control? Negative, they send surround wp here no problem. OK, so maybe just an error on their website? Knowing how whacky CA is, it wouldn't have surprised me. Someone here did post saying they mix doamacios earth in water and spray onto plants for insect control. Seems like a safe enough thing to try. Question for you guys... Is it possible to add foliage spray and surfactant to the diatomaceous and spray that in 1 go? Ice looking Fruit Punch Warren. Let us know how it tastes. They have been pretty average tasting the last couple years. Thanks for the photo Warren. Mine should be ripe any day now. It’s about 2/3 red. Do you pick and eat or lick and let sit for a few days? I let it sit a few days at room temperature until it softens slightly. Fruit punch was very Kent like (In a good way), but with pineyness near the skin. Kind of similar to Ugly Betty....at least for me. Thanks Warren, that’s the way I remembered it at the last mango tasting where there was a FP. I actually like Kent and was hoping that the FP will be more strongly flavored when grown in SoCal.